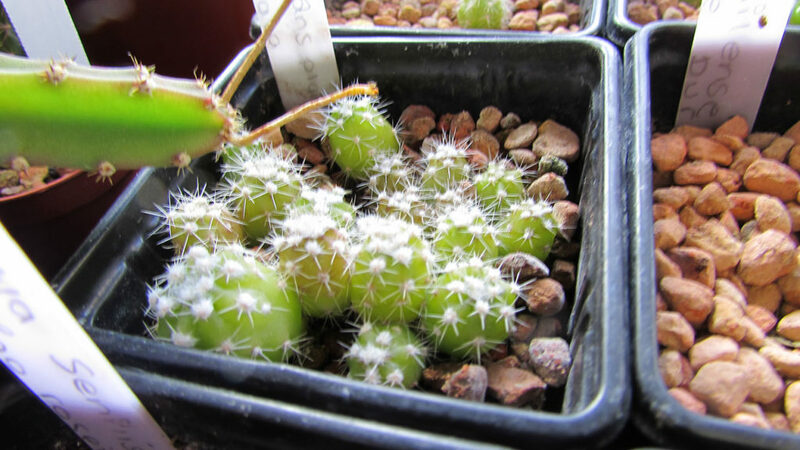 In this Blog I will be talking about how you can grow cacti and Succulent plants from Seed and talking about the method I like to use to grow my cacti and succulent plants from seed and I have had great success throughout the years using this method. Although there are many different ways to grow cacti and succulents from seed and there is no right or wrong way, In this Blog I will be showing you how to grow cacti and succulents from seed using the bag method. I have included videos I have made for my Cacti & Succulent Plant You Tube channel called Desert Plants of Avalon that include step by step instructions on growing Cacti and Succulents from seed as well as a video on how to care for seedlings during their first Winter. Why grow from Seed ? Growing from seed can be very rewarding as you get to see your plants grow from seedlings to mature plants over the years and although it can be very time consuming, knowing that you have grown your cacti and succulents from seed is a real buzz. When is the best time to grow from seeds ? Cacti and Succulent seeds are best sown in late Winter, Spring or early Summer, this is because the days are longer and the temperatures are warmer, but if you have grow lights and additional heating then you can still sow seeds in Autumn and Winter too, the most important thing is that the seeds /seedlings are kept at a minimum temperature of 70 Fahrenheit /21 Celsius. 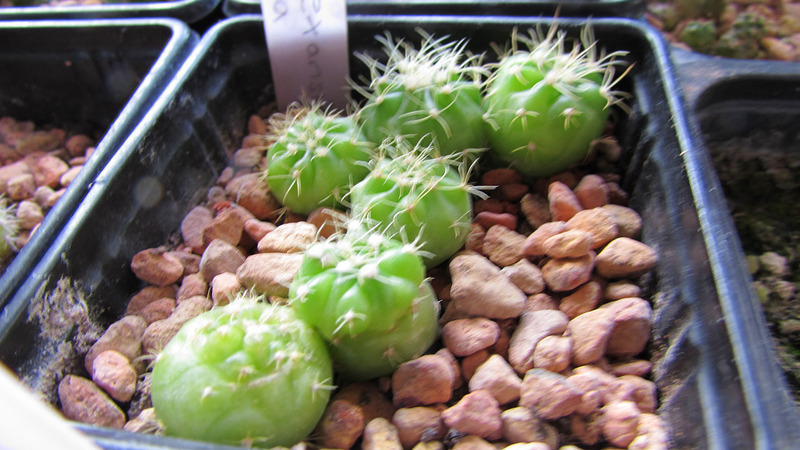 Photo: My Rebutia muscala cactus seedlings at 8 months old. What do I need to grow from Seed ? Seeds, plant pots, transparent zip lock bags, a pen, plant labels or white sticky labels, 2 parts loam based seed sowing soil ( or any well draining soil ) 1 part grit or perlite and 1 part horticultural sand. I have found that the clear fruit pots that you commonly see cherry tomatoes or strawberries sold in are perfect sizes to use as small seed pots and they fit perfect in the bags too as well being a great way to us as recycling, just make sure that you thoroughly clean them first before using them for seed sowing. How do I grow Cacti and Succulents from Seed ? 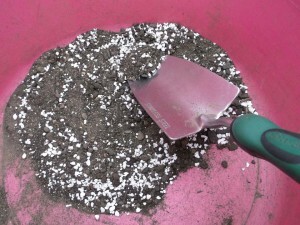 Thoroughly mix up the 2 parts seed sowing soil with the 1 part perlite OR grit with the 1 part Horticultural sand. You can use the amount of soil mix to the amount you need depending on the size of your seed pots. If the soil you are using has stones or lumps of bark chippings in it etc its best to remove these by running the soil through a gardening sieve first. thoroughly mix up the seed sowing soil with the perlite or grit and the horticultural sand, you can remove any hard stones or bark chippings etc by running the soil through a gardening sieve first before mixing. Once you have thoroughly mixed up all the soil with the perlite or grit and sand then its best to sterilise the soil by either microwaving it or heating it in the oven, this is optional but its something I like to do as it helps to reduce fungus and bacterial attacks on the young seedlings after they have germinated. If you are sterilising the soil in the microwave then put all of the soil mix into the microwave on high setting for 3 minutes stopping half way through to thoroughly sir the soil mix with a clean spoon, its important that the soil mix is extremely hot as this is what will kill any pathogens and to sterilise your soil. If you are sterilising your soil mix in the oven bake the soil mix at 180-200 F. /82-93 C for at least 30 minutes, or when the temperature of the soil mix reaches 180 F. (82 C. you can test the temperature of the soil by using a cake thermometer. Allow the soil mix to cool down before putting into the seed pot/s. Once the soil mix has cooled down put the soil mix into the seed pots and place the seed pots in a tray or trays filled with 2-3 inches of clean water, if using rainwater it may be best to boil the water first and allow to cool down so any pathogens that could be in the water are reduced. Leave the pots in the water until the soil mix in the pots is completely soaked with the water, this can take up to an hour or more but its important to be patient so the soil mix is thoroughly moist all the way through the soil. Write the name /s of the seeds you will be sowing on the Plant labels / white sticky labels that you will be putting on the bags, and also the date you are sowing the seeds. Make sure your hands are thoroughly clean then sow the seeds evenly across the surface of the plant pot/s. If the seeds are very small its best to sprinkle them on like pepper as evenly apart as possible but with larger seeds such as Opuntia or Aloe seeds you can place them onto the surface individually and gently press them down. Once you have sown the seeds you can very lightly sprinkle some horticultural sand on the top of the soil but make sure the sand is moist. By using sand this can help to minimise moss that often likes to grow on the soil that the young seedlings are growing in due to the soil always needing to be kept moist. Place the seed pots into the clear plastic bags and make sure to release all the air inside the bags first before sealing the bags. Place the bags in a bright well lit location that receives some sun but not intense sun or intense heat. Keep the seedlings inside their clear bag/s for a minimum of 3 months but you can keep them in the bags for longer than this if the seedlings are still small, I have kept seedlings in the bags for up to 10 months if they are still small and the soil inside the bags is still moist. My Echinopsis subdenudata cactus seedlings commonly known as The Sea Urchin Cactus or Domino Cactus. These seedlings are one year old. NEVER open the bag/s until after a minimum of 3 months this is to continue to keep the seedlings and soil sterile, however if you notice your seedlings have fungus or any other problems sometimes opening the bag/s may be inevitable. The young seedlings should not dry out in the bags for up to 3 months, this is because the clear bags act like a mini greenhouse and there is no room for the excess water inside to evaporate, and young seedlings do not take up large amounts of water, however if you notice the soil inside of the bag/s looks like it i drying out then you will have to open the bag/s to water before the 3 months. After 3 months you can gradually unzip the clear bags over a few days to allow the seedlings inside the bag to acclimatise to the drier air outside of their bag/s in their new environment after a few days you can then take them out of their bag/s completely. If after the 3 months your seedlings are still small then they can still stay in the bag/s for many more weeks or months if the soil inside the bag/s is still moist, sometimes I will leave my seedlings up to 9 months in the bag/s if there is no need for them to come out of them. A selection of my cacti and succulent seedlings all grown by using the bag method. How do I care for young cacti and succulent seedlings during their first Winter ? This can be confusing to many people because we are told as cacti and succulent growers to keep our plants cool and dry over Winter, but what do we do with young seedlings especially during their first winter ? because a cold and especially dry period could kill them off as the are still so young and their roots will still be fine and developing. 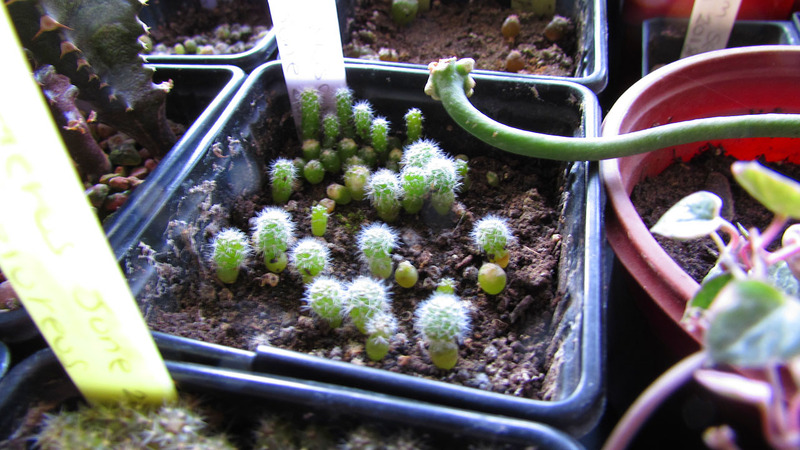 I strongly recommend that you overwinter your young cacti and succulent seedlings indoors at a minimum temperature of around 15 C/ 60 F for their first Winter. I would also still continue to water them lightly just enough to stop the delicate root hairs from drying out. In their natural habitats in Winter young cacti and succulents would be growing under the shade of larger plants and vegetation where they would naturally be receiving more humidity and warmth than their mature parents that are more exposed to the elements, therefore in nature in their natural habitats in dry arid deserts even in the Winter young seedlings would still be receiving moisture from the humidity on the lower grounds of the vegetation for their young developing root systems. After their first year you can continue to treat them as you would more mature cacti and succulents depending on their size and what type of cactus or succulent they are. In this Blog I will be writing about how you can care for and grow Aloe plants. What are Aloe Plants ? Aloe plants are Succulent plants that belong to the plant Family Asphodelaceae, Liliaceae and Xanthorrhoeaceae . Aloe’s come from Africa, India and the Indian Ocean Islands and there are Over 500 species of aloes plants, with the most common Aloe plant that is readily available being the much loved Aloe Vera plant that is a very popular houseplant and has been used medicinally for many years. 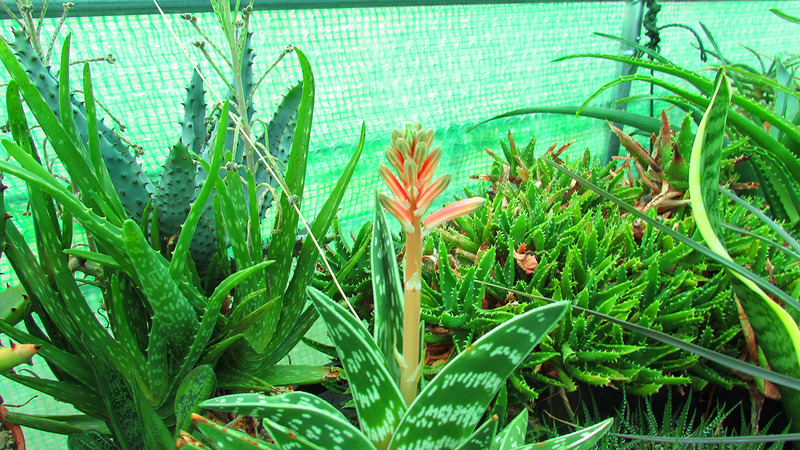 Aloes form thick fleshy succulent leaves in a rosette shape and each succulent leaf is are filled with a sticky gel. 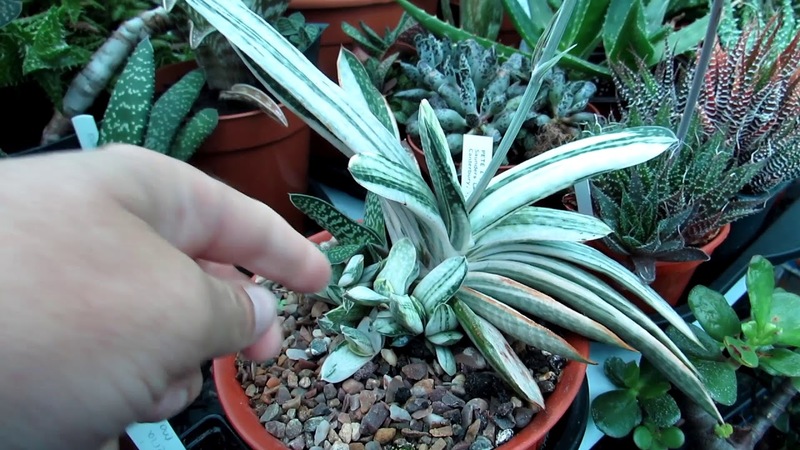 In this Blog I will also be sharing videos on Aloe plants that I have made for my Cactus and Succulent You Tube channel called Desert Plants of Avalon including a special video on How to Care for Aloe Plants. Aloe plants are often grouped alongside their related genera cousins Gasteria and Haworthia and Sanseveria, but Aloes do like more sunshine than their cousins and although they can be grown in shade they do prefer more bright strong light such as a South or west facing window that receives some sunshine or a sunny position outside that is protected from very strong sunshine and winds. Some of the tougher varieties can tolerate full all day sun. In Winter its important that Aloe plants are placed in a very bright position and if growing indoors its important these plants can receive some sunshine for at least part of the day as Aloe plant leaves can grow lanky and floppy if not enough light can be given especially in the Winter months when Aloe plants will often still continue to grow. Aloe plants can take very high temperatures in Summer as long as plenty of ventilation can be given. If you are growing these plants behind glass such as a window or greenhouse its important that plenty of fresh air can be provided on very warm days as these plants can cook at temperatures 100 F or more on a hot sunny day. In Winter its very important that the temperature never drops below 5 Celsius / 41 Fahrenheit and although these plants can survive a bit lower than this if they are kept totally dry, they can not take any frost at all and its much safer to keep these plants above the temperature of 5c / 41F especially in damper climates where humidity in Winter is a problem. Here in UK and Ireland where I live as the damp and cold can cause fungus and rots to appear on these plants. personally I would recommend keeping these plants at a minimum temperature of 7-10 C / 45-50 F if possible and I keep all my Aloe plants at around the 7 Celcius / 45 Fahrenheit in my Polytunnel over the Winter months. In Spring and Summer Aloe plants like to be given a good water preferably with clean rainwater if it is available and the soil must be allowed to fully dry out before watering again. In Winter its best to keep Aloe plants on the dry side and I only water mine lightly about once a month because I overwinter mine in a cool Polytunnel where the average Winter temperature is around 7-12 C / 45 – 55F, but if you are growing your Aloe plants indoors in a centrally heated home or outdoors in a tropical climate that has warmer temperatures you may need to water your Aloe plants more often, but its better to under rather than over water in the Winter. unlike some of the Desert Cacti and some of the other Desert Succulents that have a complete winter dormancy, Aloe plants will often still continue to grow slowly in Winter and although Aloe plants will slow down their foliage growth in Winter, this is the time they will often send out their very beautiful colourful flowers in late Winter to early Spring. Its important to use a well draining soil mix when potting up Aloe plants and I like to make my own of 1 part loam based soil and 1 part horticultural sharp sand and 1 part grit or perlite. The most important thing is that you use a well draining soil so the soil in the pot dries out easily in between waterings. You can use any good quality commercial cactus and Succulent plant soil with Aloe plants. Its best to re pot Aloe plants in the spring and Summer when these plants are actively growing. Aloe plants have fleshy water storing root systems and because of their fleshy root systems its best to cut away any dead and decaying roots when you repot your Aloe plants. 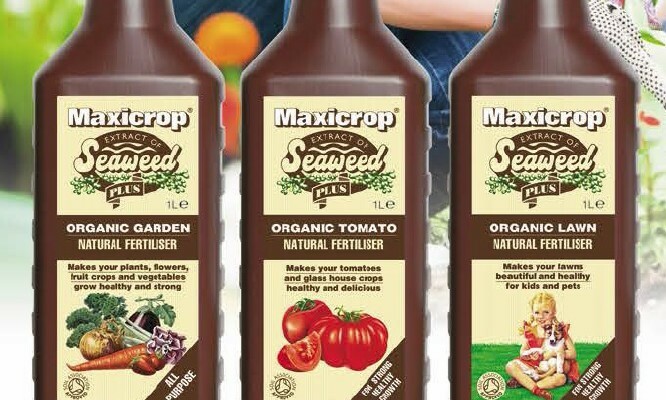 I fertilise my Aloe plants once a month from Spring until late late /Autumn using a tomato based fertiliser by Maxicrop, ( see photo below ) The reason why I like to use a Tomato fertiliser with my Succulents and cacti is that I truly believe it helps them to flower because of the high potassium in the tomato feed and I have never had tomatoes on my succulents yet haha 😀 but any good quality houseplant fertiliser or a good quality fertiliser especially for Cacti and Succulents should work well. I stop fertilising all of my Aloe plants and all my Succulents and Cacti from late fall / Autumn until Spring when the cooler temperatures and short days come and their growth slows down. Aloe’s can be fast growing plants and need to be given plenty of space to grow and thrive. Aloe plants do not need be pruned if the growth is healthy and green but its normal for the lower bottom leaves of these plants to go brown and dry up as the new growth emerges from the rosette, and these dead brown leaves can easily be removed and pruned back to make the plants look healthier and tidier. 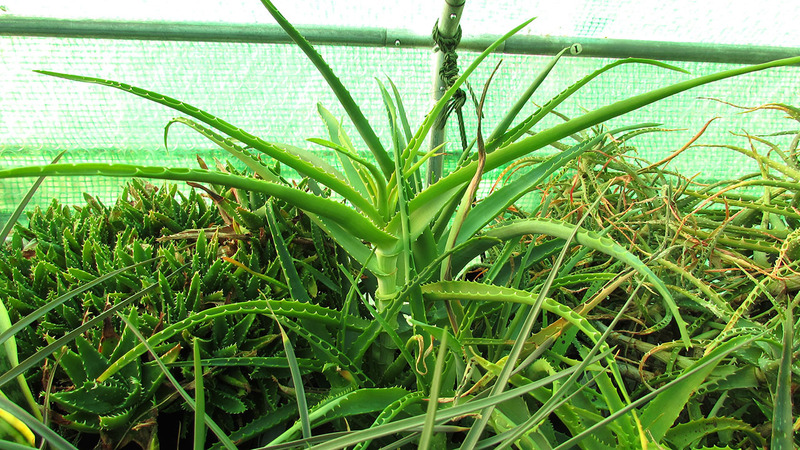 The wonderful thing about Aloe plants is that they produce lots of plantlets from around their base. The best time to divide these aloe plantlet pups from the parent plant is when you are re potting in the Spring and Summer months. You can then pot up the individual plantlets from the base of the Mother plant into individual pots to give away to friends and family. These plants will occasionally produce seed pods too if the flowers have been pollinated by other Aloe Plants also in flower 😀 and if your Aloe plants have been pollinated then once the seed pods have ripen and the pods have turned brown then you can harvest the seeds to sow them and get more Aloe babies haha. Most Aloe Plants are not self pollinating though and you would need more than one Aloe plant in flower to get seeds. If you are lucky enough to find seed pods on your Aloe plants and you want to know How you can harvest the seeds from the pods and also when the seed pods are ready to be harvested, then watch this video below that I have made for my Cactus & Succulent You Tube Channel called Desert Plants of Avalon. The Biggest problem with Cacti and Succulents including Aloe is Mealy bug they are the pain of any succulent plant lovers life haha and the best way to treat them is with using a solution of Isopropyl alcohol /rubbing alcohol and also Horticultural neem oil for treatment of prevention long term. The Isopropyl alcohol is best to treat the bugs that you can visually see and the Neem oil helps to keep the bugs away long term. Here is a video below that I have made for my You Tube Channel called Desert Plants of Avalon on How to Care and Grow Aloe Plants. In this Blog I am going to be talking about a very weird and very wacky Succulent plant called Euphorbia platyclada and I have also made a special care video on this plant for my Cacti and Succulent You Tube channel called Desert Plants of Avalon and I have the video at the bottom of this Blog page. Euphorbia platyclada belongs to the Euphorbiaceae group of Succulent plants. Euphorbia platyclada is a real oddity and because of its ‘weird and dead like’ appearance it is more commonly known as ‘The dead Plant’ ‘Dead Stick Plant’ ‘Dead Wood Plant’. Euphorbia platyclada is a weird and wacky and unusual wonderful little Succulent plant that always looks dead. This weird and wacky plant is a pinky brown colour and the pink colour becomes brighter in bright sunshine and during the Summer months, in the Wintertime this plant loses its colour more and goes a lighter pink almost grey appearance. The stems are flattened and mottled and hard to the touch resembling ‘dead scabby sticks’ and they emerge from a heavy rootstock, the plant itself is small and totally leafless, the flowers are extremely small and are a orange yellow colour. The plant itself is not very pretty haha but personally I love its uniqueness and wackiness and I love anything that is different from the norm haha. Euphorbia platyclada is from Madagascar in Africa where it grows in its natural habitat on the floor of forests. Euphorbia platyclada loves a hot and sunny position such as a south facing window or in a sunny greenhouse or conservatory. These plants can be placed outside during the Spring and Summer months as long as they can be protected from excess rain and winds. They can take a very high temperature as long as plenty of fresh air can be given, In Winter its best to keep these plants above 10c / 50F but they can take lower than this for brief periods especially when kept dry but never overwinter them any lower than 5c / 41F as they can be prone to rot and fungal diseases at temperatures lower than this, ideally try to keep above 10c / 50F at all times. These plants like plenty of water during the active growing season from Spring to early Fall / Autumn but always allow the soil in their pots to fully dry out before watering them again because Euphorbia platyclada just like all Euphorbia Succulents do not like their roots to be sitting in wet soil as this can cause root rot. From mid Fall / Autumn to late Winter reduce watering to the bare minimum and only water enough just to stop the plant from shrivelling too much. In the Winter I only water my Euphorbia platyclada once every 2 months and I overwinter it on a sunny south facing window in my Kitchen. Rainwater is always preferable to tap water if it is available. Euphorbia platyclada like to be grown in small pots due to their small but heavy rootstock, it is always safer to under rather than over pot, and grow them in a well drained soil especially for Succulent plants, I like to make my own soil mix up for my Succulents and cacti and use a loam based soil with added perlite or grit and added horticultural sand, but you can use any well draining soil mix to your preference, the most important thing is that the soil is free draining. Re potting is always best done during the Spring and Summer months. These plants can easily be pruned to keep in shape and cuttings can be taken to be propagated by allowing the cutting to ‘callus’ over for a few days before planting in a well drained soil mix. Its important to be careful when taking cuttings of all Euphorbia plants because of their milky sap than can be irritating to the skin and extra caution should be taken when taking cuttings of all Euphorbia Succulents. Its always so much fun to grow seeds from your very own plants, and at this time of year during the Winter months your Schlumbergera cacti that are more commonly known as the Holiday Cacti, Christmas or Thanksgiving Cactus may be all blooming lovely. When your Schlumbergera cacti are all blooming lovely this is the perfect time to have fun pollinating the flowers to see if you can get seeds. Pollinating the flowers is very easy to do and in this Blog I include a few videos that I have made for my Cacti & Succulent You Tube channel called Desert Plants of Avalon where I show you on video exactly how you can pollinate the flowers for seed. Its so much fun to play the Bee and pollinate your Christmas cactus flowers to see if you can get fruit and seed. All you need is a Schlumbergera cactus that is in flower, preferably with at least two flowers on as from my own experience I have always find it more successful to cross pollinate the flowers on either the same plant or if you have two different flowering Schlumbergera at the same time, for example a red flowering one and a pink flowering one you can cross the flowers between both of them. So How do pollinate the flowers for seed ? All you need to do is use a clean tiny brush for example a tiny paint brush, lip brush or a q tip cotton bud, and load the pollen from the flower and then dab the pollen from the flower onto the stigma of the flower, this is best if you only have the one flower but if you have more than one flower its best to take the pollen from the the one flower and dab it very gently onto the stigma of the other flower or flowers. 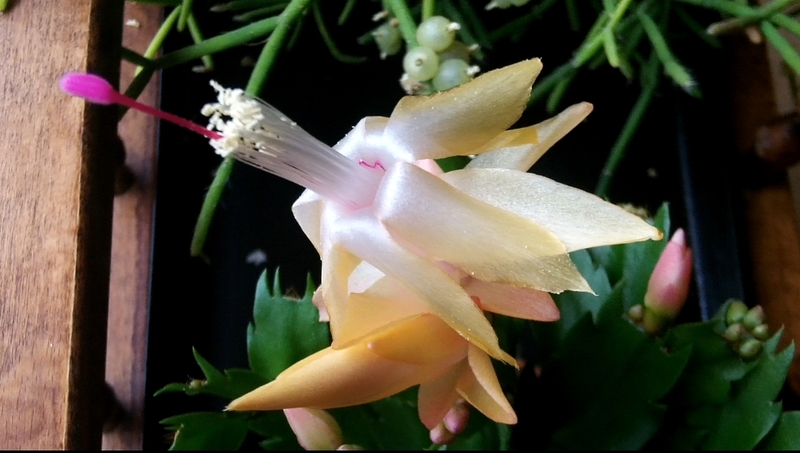 If you want to cross pollinate two different flowering Schlumbergera cacti for example a white one crossed with a red or pink or orange then you simply dab the pollen from the one flower/s from the one Cactus onto the other stigma on the other Cactus flower. How do you know when your pollination has been a success ? It can take many weeks, months and even as long as a year for the fruit to be fully ready for harvesting, and you will know when the fruits are ready to harvest for seeds because the fruit pod will go very soft and often a dark red colour just like a juicy small berry. There are many different methods on growing cacti from seed, but personally I like to grow my seeds in pots that are then placed into ‘baggies’ this keeps the seeds and young seedlings moist at all times without having to worry about the soil drying up. After about 3-6 months depending on their size I then remove them from the clear bags and treat them as young seedlings always making sure the soil is moist but not soggy. Spring is always the best time to sow seeds including all cacti seeds, but if you have grow lights and additional warmth then you can get sowing them at any time of the year. 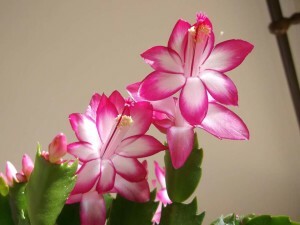 Good luck with pollinating your Schlumbergera cactus flowers and let me know in the comments below if you have had success with pollinating the flowers and growing these beautiful cacti from seed. Here is a video below that I have made for my Cacti & Succulent You Tube Channel called Desert Plants of Avalon on the update on my Schlumbergera Christmas Cactus seedlings that I have grown from seed in June 2018. 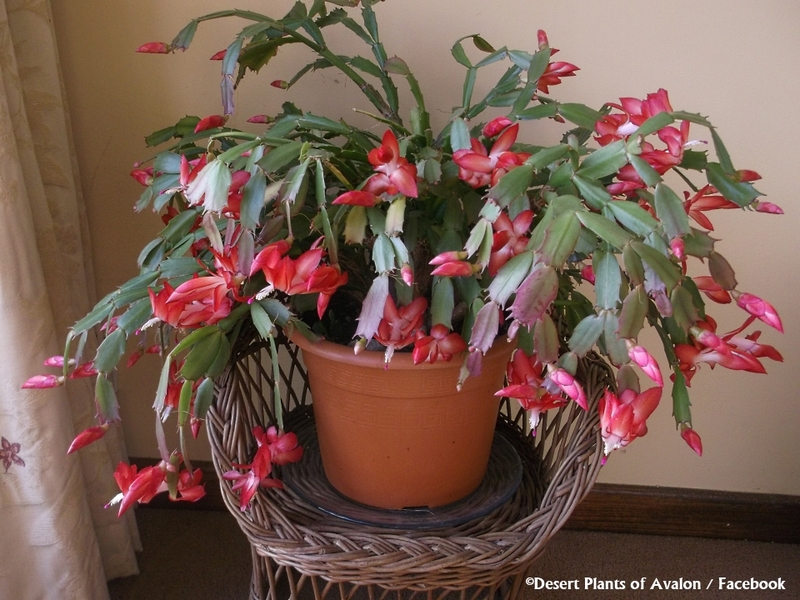 In this Blog I will be sharing my tips and tricks and also sharing lots of links to videos I have made for my You Tube channel called Desert Plants of Avalon on ‘How you can care for and Grow your Schlumbergera cacti also known as ‘Christmas and Thanksgiving cacti’. Its that time of year again and Christmas is very near upon us, and if you live in the Northern hemisphere like I do then at this moment its the cold short and dark days of Winter. The good news is though its the short and dark days that encourage our Schlumbergera cacti more commonly known as the Christmas and thanksgiving cacti to bloom in the most beautiful and magnificent of flowers and in many colours, and with the many hybrids that are commonly available now you can guarantee a blooming lovely time with these Epiphytic Rainforest cactus plants. 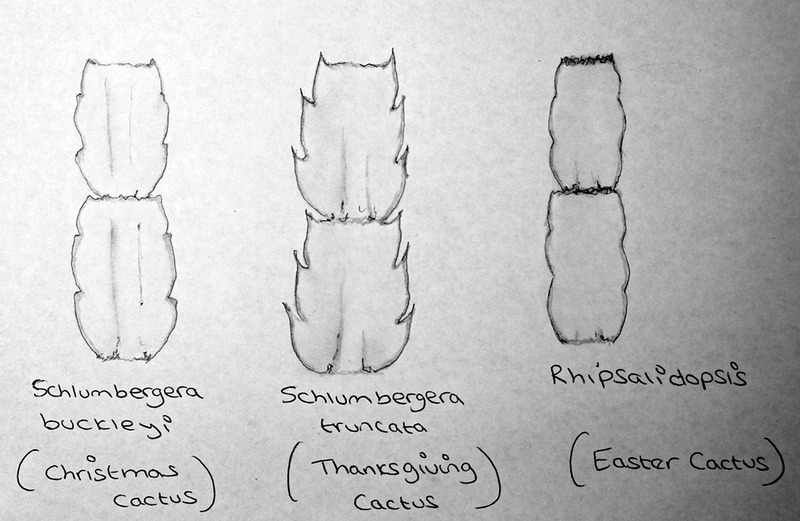 What are Christmas and Thanksgiving Cacti ? Christmas and Thanksgiving cacti belong to the cactus family Schlumbergera. In their natural habitats these cacti grow in the tropical Rainforests and are epiphytic cacti that grow hanging off trees for support. In the tropical Rainforests these cacti receive a lot more shade and moisture than their desert loving cousins. 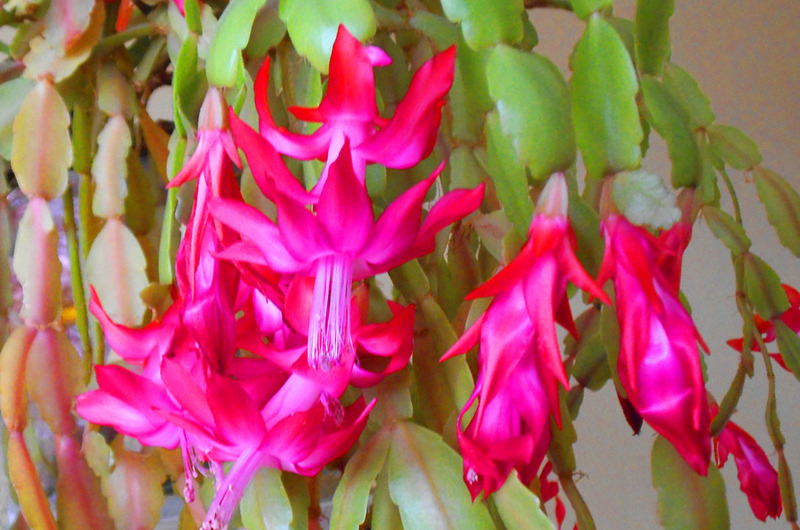 There are two different main types of Schlumbergera: Schlumbergera truncata and Schlumbergera buckleyi. The Schlumbergera truncata is the one commonly known as the Thanksgiving Cactus and the Schlumbergera buckleyi is the one commonly known as the true Christmas Cactus. So how do you know if the one/s you have are the true Christmas Cactus or the Thanksgiving cactus ? especially as most Schlumbergera cacti that are sold in the shops are all just labelled as Christmas Cactus, the difference is in the shape of the leaf segments as well as their flowers and also their flowering times. To find out which Schlumbergera that you have here is a link to my Blog I have made on this website on How to tell the difference between Christmas and Easter and Thanksgiving cactus . Schlumbergera like bright but indirect sunshine and prefer to be placed in a semi shade position away from direct sunshine. If placed in full sunshine these plants can suffer from stress and their stem segments will turn pink or go yellow if receiving too much sunshine, remember these plants naturally grow in Rainforests and therefore prefer more shade than the desert types of cacti do, a bright position where they will be able to receive plenty of natural daylight and indirect sunshine suits these cacti best. If only a South facing position is available then cover the window/s with a shade cloth or net curtain so your Schlumbergera cactus receives indirect sunshine. Schlumbergera can be placed outdoors during the Spring and Summer months where they can get plenty of fresh air, but make sure they are placed in a shady spot and away from direct sunshine, strong winds and heavy rains. From late Summer if your Schlumbergera is growing in the house in a room where artificial lighting is on this may discourage buds from forming on your Schlumbergera, its best to provide the natural daylight of the days from late Summer onwards when buds are forming. If you have your Schlumbergera growing in a room with artificial lights on in the evening then its important from early September that you move your Schlumbergera into a spare room that has no artificial light on so the days and night are natural to the Schlumbergera, this is important because its the shorter day length and the drop in nighttime temperatures that encourage buds to form on your Schlumbergera. Its important that you grow your Schlumbergera in a room that does not receive artificial light of an evening as this may prevent buds from forming. Water Schlumbergera only when the soil is dry, its important to allow the soil in the pot to dry out in between waterings to avoid root rot as these plants like to be well drained. Rainwater is always preferable to tap water if it can be provided, otherwise tap water left to stand overnight to allow chlorine and other gasses to dissipate is best. Schlumbergera like more humidity than their desert loving cousins and although they can take drier conditions, they tend to drop their leaf segments if they are in too dry an atmosphere as well as their buds, its best to keep these plants regularly misted with rainwater and away from radiators and other air conditioning or heating. SUMMER: In Summer Schlumbergera prefer temperatures no higher than 80 Fahrenheit / 26 Celsius but they can take higher if they are given plenty of fresh air ventilation and away from direct sunshine and kept well watered during the warm Summer months. WINTER: In Winter they prefer to be kept at a minimum temperature of 50 Fahrenheit / 10 Celsius, as lower than this they can suffer from leaf segment drop and also be prone to cold damage with brown scabs and scarring on their leaf segments. They can take lower temperatures than this if they are kept more on the drier side, and in my Polytunnel I have to keep them cooler at a minimum temperature of around 45 Fahrenheit /7 Celsius due to the high electric bill I would otherwise have haha, and I find that as long as I keep them more on the dry side but still watered lightly once a month they still do really well and flower amazing for me. However it is essential that you do not keep Schlumbergera any lower than 40 Fahrenheit / 5 Celsius for any long period of time as these plants can rot and scar badly and even die from fungal attacks if they are kept lower than these temperatures. It is absolutely essential that these cacti are also never exposed to freezing temperatures at any time. If growing these cacti on a windowsill its important to keep them away from a radiator directly below the windowsill as the central heating will dry out the stem segments, these Cacti like more humidity that the desert cacti do. If the only position you can give them is on a window with a radiator below then its important you place your Schlumbergera on a large tray that is filled with gravel that is kept moist at all times. From late Summer it is important that you allow the night time temperatures to drop in comparison to the daytime temperatures as the drop in temperature as well as the shorter day length encourages these cacti to form buds. Feed Schlumbergera with a good quality liquid houseplant fertiliser from Spring until mid Summer with every 4th watering you give them. Stop fertilising from late Summer when the buds are starting to form. Its important that a well draining soil mix is used with Schlumbergera as they like grow naturally hanging from trees where they would have lots of aeration. Schlumbergera prefer a compost that is well draining, but not as sandy as desert cacti as Schlumbergera like to be kept much more moist, so ideally a normal good quality houseplant soil with added peat and perlite or a good quality cactus soil with added peat and perlite would be ideal, or you could also use an Orchid soil too. Personally with my Schlumbergera’s I like to use a soil mix of 50% John innes number 2 which is a loam based compost ( but any good quality loam based compost would work the same) with 30% perlite and 20% peat and I find that my Schlumbergera grow happy in this soil mix. Repotting is best done every two years, but always go for a pot just a big larger than the last one as these plants flower better if slightly under rather than over potted, this is because planting these Cacti into a much larger pot will encourage them to form lots of new vegetative growth but may not flower for a couple of years as their energy will be going towards forming lots of new roots and top growth. The best time to re pot Schlumbergera is when they are starting to come back into new growth after their flowering Winter rest and is best done in Spring or early Summer. Avoid re potting Schlumbegera from September as this is the time of year they will be starting to form buds, re potting at this time of year can discourage blooming as after repotting their energy will be going to the root system instead of the buds. Here is a video I have made for my You Tube Channel called Desert Plants of Avalon on How to Re pot A Christmas Cactus. Propagating Schlumbergra from seed is a time consuming process but if they are seeds from your own plants this can be fun to do, Schlumbergera can be easily pollinated by cross pollinating two blooms on either the same plant or on two different plants, personally I have much more success when I cross pollinate flowers from two different Schlumbergera’s often with different flower colours. 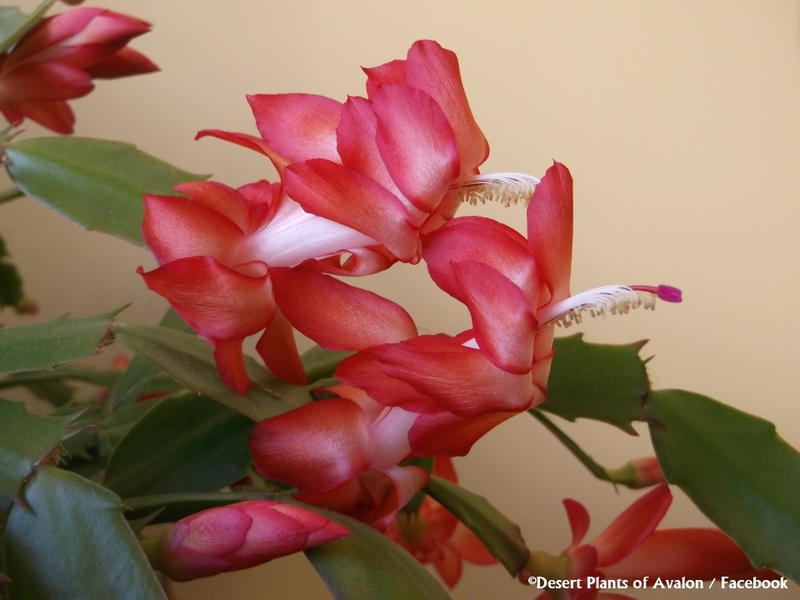 If you want to know how you can pollinate the flowers on your Schlumbergera please check out the video below I have made for my You Tube Channel called Desert Plants of Avalon. To encourage blooming with Schlumbergera its important from early September to keep the night time temperatures cooler than the day time temperatures to encourage the buds to form. Schlumbergera also prefer to be slightly root bound rather than over potted as this also encourages buds to form. If growing indoors its important to keep these Cacti away from artificial light sources as this can prevent your cactus from forming buds as it is the shorter length in days as well as the drop in night time temperatures that encourages these cacti to form buds, its best to place in an cool unheated room close to a window that has natural daylight but away from direct sun. 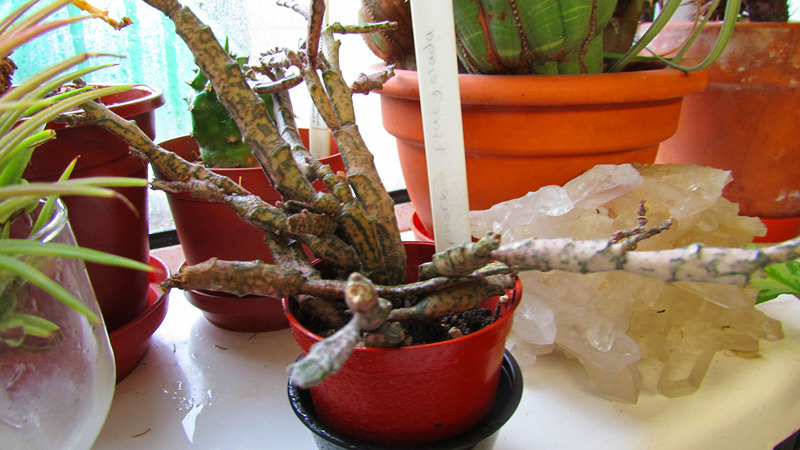 This is a very common problem especially with Schlumbergera Cacti. Its so common for people to buy a Schlumbergera full of buds from a garden shop only to find the buds all drop off a few days later. The main cause of bud drop in a newly purchased Schlumbergera is a shock to the plant after being grown in a commercial nursery often in another country and almost certainly grown under artificial lights and heat for fast selling to the public and then the plant is moved to a shop for selling and then moved again to your house, the shock of the move/s can cause your Schlumbergera to abort the buds. Be careful when bringing your newly purchased Schlumbergera home from the garden shop as the dramatic difference in temperatures from a warm centrally heated garden shop to the fresh cold air outside can shock the plant in the middle of Winter. When buying any tropical plant in Winter its best to wrap some fleece loosely around the plant/s before leaving the garden shop to walk to your car, or public transport. Bud drop in Schlumbergra can also be caused from over or underwatering, too hot or too cold a room, or moving the plant suddenly from a bright position to a dark position or vice verse. Keeping your Schlumbergera behind a cold curtain over a window of a night as well as cold draughts can also cause bud drop. Pests like Mealy bugs, and Aphids also like to hide in between flower buds and eat the buds juices causing the buds to fall off prematurely. After flowering its normal for your Schlumbergera to look a bit sad and the leaf segments to go limp and lifeless and even a bit shrivelled, please do not panic, this is normal as your Shlumbergera has been sending all of its energy towards making buds and now it want to rest. Allow your Schlumbergera to rest and withhold watering for a month after the flowers have finished to allow the plant to rest and relax ready for its forthcoming new Spring growth. If you can place the plant in a cool room to rest ( below 18 Celsius / 65 Fahrenheit but above 50 Fahrenheit /10 Celsius ) this would be ideal If your plant shows signs of shrivelling or it is in a centrally heated room then still continue to mist the stem segments regularly but only water the soil the month after flowering if your Schlumbergera is shrivelling, otherwise leave the soil dry, and then continue as normal the following month after flowering. 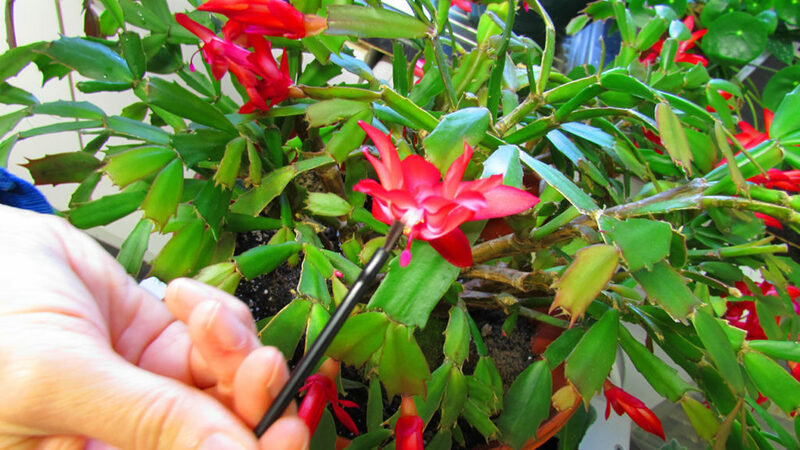 There is no need to prune a Schlumbergera unless the Stem segments get damaged or start to look unsightly or if you want to keep your plant looking more compact in shape or you do not want to have the stem segments hanging too long. To prune all you need to do is use clean sharp pruning shears and cut away at the parts where the stem segments join. If the stem segments are healthy then you can give them away to your friends, family and neighbours as gifts for them to propagate. Thankfully Schlumbergera are hardy cacti and don’t tend to get the common pests that other houseplants seem to get such as greenfly and thrips, however Schlumbergera can be prone to Mealybug and also scale insect, both of these pests tend to hide on the underside and in between the leaf segments on these plants making them hard to spot until damage has been done. The best and most natural and safe way for dealing with both Mealy bug and also Scale insect is to use Isopropyl alcohol ( rubbing alcohol) and dab the pests with this using a small soft brush. I have made a few videos about this on my You Tube channel called Desert Plants of Avalon and below is a video where I show you How to remove Mealy bug from cacti using Isopropyl alcohol (rubbing alcohol ) In the video I use a Hylocereus ( Dragonfruit Cactus ) as an example but exactly the same method can be used for Schlumbergera. As a very good preventative as well as a long term treatment I like to use Horticultural Neem Oil mixed with Horticultural soap to use as soil drench and as a foliage drench to prevent pests on all my Cacti and Succulents. Here is a video I have made for my You Tube channel called Desert Plants of Avalon on How to use Neem oil as a preventative and treatment for pests on cacti and succulents, it is also a very good natural fungicide too. Schlumbergera are not prone to many diseases if grown correctly, but the most likely problem with disease is fungus or stem rot and this is nearly always caused from overwatering, or too cold and damp conditions or quite often a combination of all three. In this Blog I will talking about how you can tell the difference between Christmas and Thanksgiving cactus and also sharing a link to a video I have made for my Cacti & Succulent You Tube Channel called Desert Plants of Avalon where I go into more detail about the differences between Christmas and Thanksgiving Cactus and also Easter Cactus. Schlumbergera Cacti typically flower from mid October until late January but its not unusual for these cacti to flower at other times of the year too especially if they are grown indoors under artificial light source. The true Christmas Cacti are called Schlumbergera buckleyi and these cacti flower later than the more commonly seen for sale Thanksgiving cacti the Schlumbergera truncata Cacti, Schlumbergera buckleyi ( Christmas cactus ) flowers early December until late January, and Schlumbergera truncata ( Thanksgiving Cactus ) flowers earlier from early October until late December. SO HOW CAN YOU TELL THE DIFFERENCE BETWEEN THE TWO ? Schlumbergera truncata has stem segments that are claw like and the flowers are more erect and usually this cactus will bloom from early October until late December. Schlumbergera truncata is the Thanksgiving cactus and this Cactus has stem segments that have crab claw edges on its segments that resemble crab claws, ( see diagram below ) and the Thanksgiving cactus ( Schlumbergera truncata ) is often nicknamed the crab cactus for this reason. Schlumbergera truncata ( Thanksgiving Cactus ) comes in many different varieties of colours due to the many hybrids now available and this cactus is the one that is most commonly seen for sale around the Christmas time and also wrongly named Christmas Cactus when it really is a Thanksgiving Cactus. The blooms on Schlumbergera truncata also are more erect and do not hang down like the blooms on Schlumbergera buckleyi. Schlumbergera buckleyi ( Christmas Cactus ) has rounded scalloped segments and the flowers hang down towards the ground. The blooms usually form later from November until mid February. Schlumbergera buckleyi is the true Christmas cactus and this cactus has stem segments that are flattened and with smooth and scalloped edges that are not toothed ( see diagram below ). This Cactus is very rarely seen for sale these days in garden shops and nurseries and if you have recently bought a cactus labelled at ‘Christmas Cactus’ it is nearly always 99% a truncata and not a buckleyi. The blooms on Schlumbergera buckleyi hang down on the stem segments. Rhipsalidopsis gaerneri is the Easter cactus and the stem segments are even more rounded and have hairs on the tip of the segments. 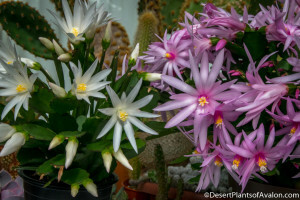 The flowers are much smaller and star shaped in appearance compared to the flowers on Schlumbergera and this cactus typically flowers from March until May. Rhipsalidopsis gaertneri is the true Easter Cactus and this cactus also has stem segments that are very rounded with scalloped edges and the segments have a hairy covering at the tip of each segment and often have a red edging to them, ( see diagram below ) the flowers are also much smaller on Easter cacti and this cactus commonly blooms from the March to April time. Here is a video that I have made for my Cacti and Succulent You Tube channel called Desert Plants of Avalon where I explain in lots more detail how you can tell the difference between Christmas, Thanksgiving and Easter Cactus. In this weeks Blog I talk about how you can use a certain type of Cat Litter that is made from 100% Molar clay as a grit replacement and also as a top dressing for all of your Cacti and Succulent plants. I have recently been using this cat litter as a grit and perlite substitute and as a wonderful component of cactus compost for my cacti and succulent plants, I have been using it as a top dressing too 😀 BUT Please note DO NOT use other types of cat litter ONLY ones made from 100% Molar Clay and non clumping, and I will ONLY be recommending the one I use in this Blog as I have been using it myself with great success. 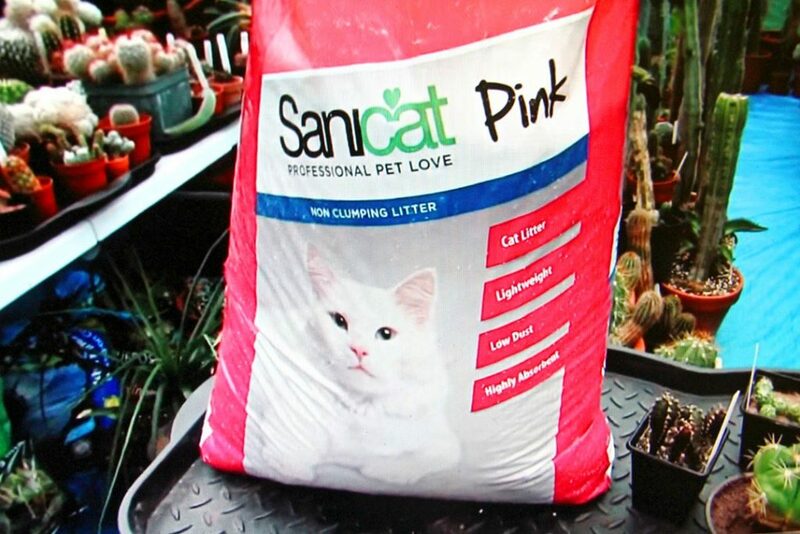 Sanicat Pink lightweight low dust and non clumping cat litter made from 100% molar clay used as a top dressing on my cactus plants. 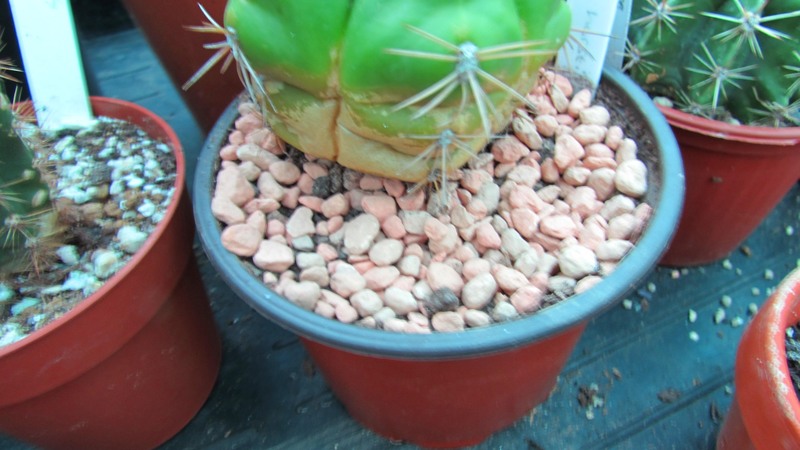 I first heard about using cat litter as a grit and perlite replacement from my Cactus and Succulent Society friends here in Ireland. My friends had been using a brand of cat litter from Tesco that is made only from 100% molar clay and sold as Tesco ‘Low Dust Lightweight Cat litter. Tesco is a common Supermarket chain here in UK and Ireland, but sadly Tesco have now discontinued this brand of cat litter and it is no longer available. Thanks to my wonderful friend Alex I have found a very good 100% molar clay cat litter replacement. Alex recommended this product to me after using it on his own beautiful succulent plants and Alex has also had amazing success with growing his succulents using this cat litter as a 100% soil alternative and growing his plants in just this cat litter alone and he has noticed such a difference with the roots of his plants being nice and healthy. The cat litter I am recommending is by Sanicat also sold as Sophisticat and it is the pink non clumping cat litter low dust and sold as 100% molar clay. BUT Please note DO NOT use other types of cat litter ONLY ones made from 100% Molar Clay and ones that are non clumping and non perfumed, and although this cat litter does have a very light perfume it is harmless to your plants and goes away after the first watering. Sanicat Pink cat litter low dust, lightweight, and non clumping. It is so important that you only use the brand I am recommending or a cat litter that you know is definitely a non clumping 100% pure molar clay variety as any other types of cat litter are intended for cat litter trays and not cacti and succulents and all other types of cat litter are sold for cats and are not suitable for cactus soils, therefore any bag of cat litter will not do and can be very harmful to your plants if you use it. I love to make my own cactus an succulent soil and previously I have always used horticultural sand and grit or perlite and a loam based soil such as John innes number 1, 2 or 3 but for the past 3 months now I have been using this cat litter at a ratio of half and half of 50% cat litter to 50% loam based soil and I mix both of these ingredients equally, and so far I have been very impressed. Winter is very nearly upon us and we have already had a few chilly nights here in Belfast in N.Ireland, Luckily I have just finished bringing in the last of the Cacti and Succulents that are not cold hardy from the Polytunnel into the house to overwinter them. 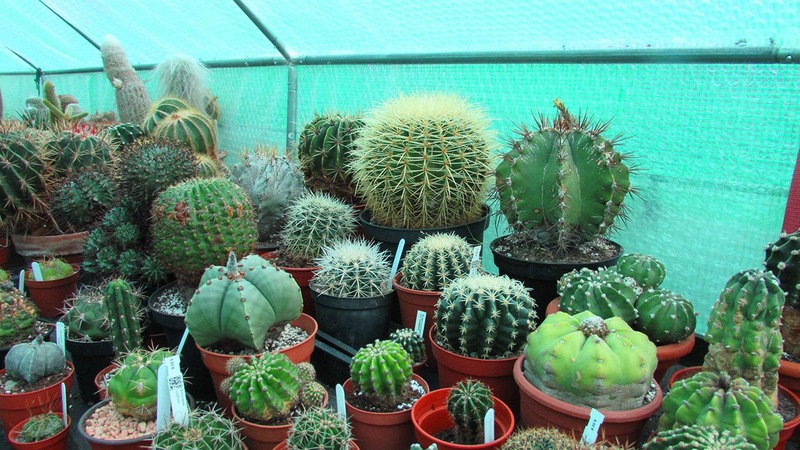 If you are like me and live in the Northern hemisphere and you grow cacti and succulents either outdoors or in a greenhouse or polytunnel then you will need to protect any of your plants that can not tolerate the cold temperatures we get here on this side of the planet. During the Autumn and Winter months I heat my polytunnel at a minimum Winter temperature of 5 Celsius / 31 Fahrenheit and I have a thermostat control that switches on if the temperature drops below 5 c / 41f inside the polytunnel, this allows us to keep a large proportion of our cacti and succulents safe over the Winter to overwinter them during their Winter rest period, but also still warm enough for the Winter growing Cacti and Succulents such as the South African Succulents and the Schlumbergera cacti commonly known as the Thanksgiving and Christmas Cacti that still continue to grow and flower during the Winter. 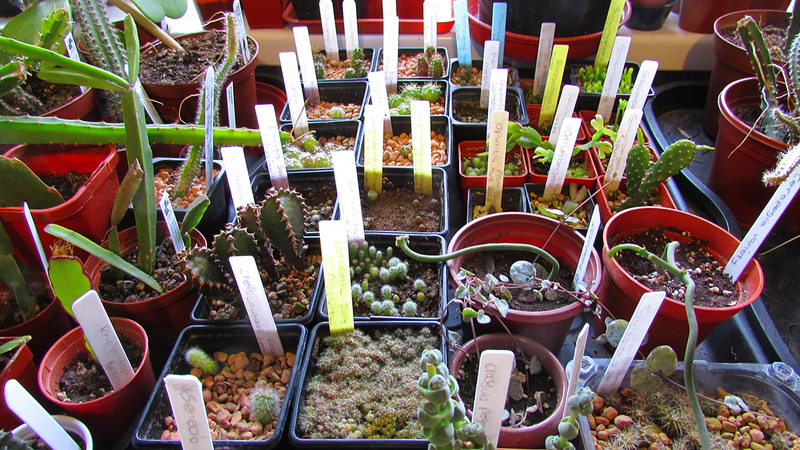 The Cacti and Succulent Plants that are all going to be left overwintering in the Polytunnel, these plants will be kept at a minimum temperature of 5 Celsius / 41 Fahrenheit, I have a thermostatic heater that switches on if the temperature in the polytunnel drops below that. There are so many different cacti and succulents and they all vary so much in their minimum Winter temperatures and also the minimum temperatures vary so much depending on where they are growing, for example cacti that are being overwintered cool and dry in a dry arid climate with low humidity can survive much lower temperatures, and some of the desert cacti like Opuntia and Rebutia can even survive temperatures that are below freezing compared to the same types of cacti that are being overwintered cool and dry but are in a humidity high country such as where I live here in Ireland and UK. 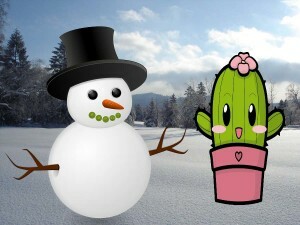 Most of the Cacti and Succulents like to be overwintered cool and dry and bright ideally at a temperature between 5 – 10 Celsius / 41 -50 Fahrenheit, this encourages them to stop growing and they get to rest over the winter and also encourages blooming in the Spring and Summer of the following year.